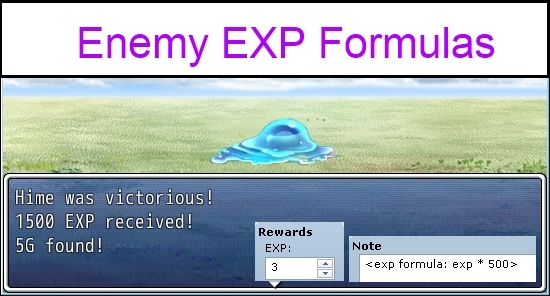 This script allows you to use a formula to calculate how much exp is obtained from an enemy. Where the FORMULA is any valid ruby formula that returns a number. If no exp formula is specified, then the default exp is given. I do have a question though: Is there a formula that lets you calculate the Exp different depending on whether or not one of two switches is active? Handy script 🙂 Nice to see some customisation for enemy exp. Updated to support “this enemy” formula variable. Once again, the proliferation of your work often precedes need! its is possible to give different xp for each member of the party? ex. actr1 is level 20. so the actr will gain 90% of the given xp. actr2 is level 30. so the actr2 will gain 80% of the given xp. Not with this script. This only determines how much exp an enemy gives, not how much a particular actor obtains.